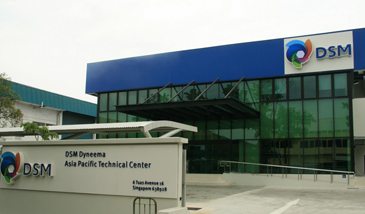 The Netherlands, Jan. 11, 2013 — DSM Dyneema, the inventor and manufacturer of ultra high molecular weight polyethylene (UHMWPE) fiber branded as Dyneema®, officially opened its new Asia Pacific Technical Center in Singapore today (Jan. 11, 2013). The 2.500 sq m state-of-the-art center, its first in the Asia Pacific region will support the technological capabilities for customers and reinforce the already strong commercial and innovative success of Dyneema® in all its core businesses across life protection, commercial marine, industrial, sports and new business development initiatives in this region. In addition to traditional materials testing capabilities, the center houses Singapore’s first-ever independent ballistics testing facility, featuring two ballistic ranges, as well as labs for conducting comprehensive tests for both personal and vehicle armor applications in Dyneema®. Tests can be carried out in accordance with international and regional ballistics standards. For DSM Dyneema, this will be the third global ballistics testing facility, complementing the existing technical centers in the U.S. and Europe. At the opening ceremony, Gerard de Reuver, President of DSM Dyneema, spoke of the company’s excitement of the new Asia Pacific Technical Center. “The Asia Pacific region is a key part of our global corporate strategy focusing on high growth economies,” he said. “With the opening of our new center we will provide our customers in this region with the support to ensure all their innovative and technical needs with Dyneema® are met – truly With You When It Matters."